I would like to call Amrom Adar a “new” star. However, this album came out quite a few months ago so his popularity has definitely picked up across the universe. Now just in case you haven’t caught on yet, this guy is the real deal. He can sing like a typical frum Jewish singer, Israeli style, Haimish/Chassidish, and even chazannus! His voice is from the most uniquely versatile in the industry. He is presented by Yochy Briskman. He truly finds the best singers! Let’s take a look at some of his songs. V’ilu Finu – Composed by Yochanan Shapiro from Acheinu and a star soloist on Amudei Shaish. It’s a sweet song that puts these words from Nishmas that we say on Shabbos in a focused and calm demeanor. If you like Nishmas from Shloime Gertner #2 you will appreciate this too. Halaila – A catchy hora that became very popular in a music video. 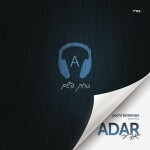 It’s composed by Yitzy Waldner and has a very upbeat techno feeling to it. He sticks in a Sefardic shtikel towards the end that’s very appropriate for hora. It is quite fitting to be sung by weddings. If you indeed heard this sung by weddings , please let me know in the comments below. Aneini – Composed by Yoni Eliav . It’s an upbeat song that Amram’s voice shines in the high part. Kesser – Kodosh – This is a 2-part song. The first part – Kesser is a shtickel chazzannus composed by Dr. Mordechai Sobol and the second part Kodosh is a hartzige nigun composed by Yitzy Waldner. They really blend well together like an Avraham Fried 2 part song that has chazzannus first . The only difference is that Amram sounds like a real chazan – not a singer that’s singing chazannus. Then in Kodosh, he transforms back into a real singer – not a chazan that can also sing! It’s an amazing experience for a music fan who likes to combine different styles in one song. But the fun part is when he sings “Kodoish” when it becomes chazzanus again! Ad Matai – A beautiful hartzige song sung in Hebrew about tefilla. It is composed by Yoel D. Goldstein and Yitzy Waldner. There is a child soloist – Moshe Green who has a strong hartzige voice. The best part is when he goes really high “Ad Matai” a few times in a row. It is sung again as the last song of the album in a Yiddish version with the same child soloist. You can see how he is just as comfortable in Yiddish as Hebrew. Wow! Brich Shmay – Composed by Amrom and Yitzy Waldner. A hartzige 3 part slow song where Amrom goes quite high once again. Once again the child soloist Moshe Green has a appearance. Yismach – Once again composed by the great Yitzy Waldner! My favorite song from the album that emphasizes his versatility. It starts as a Sefardic hora then changes to Yeshivish, then the high part in Yiddish! Should be a hit by weddings of all types.